In 1992, I was assigned my first weekend of on-call support for MVS Operations. I was handed the team PC that had a 2400 baud modem and a pager. On Saturday night, my pager went off about a batch job that had abended. I dialed in (a process for sure), and after several phone calls and frustration I decided that I had to drive in to work through a blizzard to work on it from a workstation at the office. A few years later, we had faster connectivity and our own PC’s. Support was a lot easier from home, but we were still tied down to a PC. Even today, many mainframe performance analysts are required to have a laptop that they carry from place to place to support z/OS systems. Wouldn’t it be nice to ditch that old laptop and do effective support from any connected device? 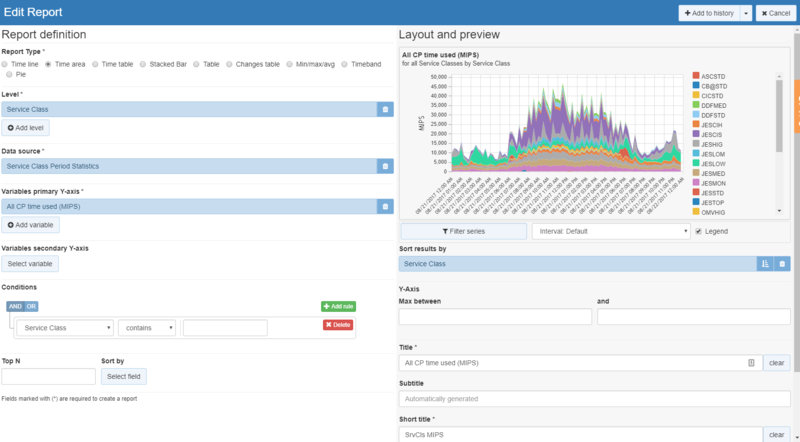 Besides just breaking free from the PC, there are certain capabilities and reporting features that make a z/OS performance analyst much more effective. Through all my years of being a performance analyst for z Systems, I’ve gone through it all – from coding my own static reports, to using GUI-based systems and interactive reports. In my experience, every mainframe performance analyst for z/OS systems needs the following 9 essential features to make their job easier and more efficient. A lot has changed since 1992. In today’s world there is no reason that you shouldn’t be able to perform your job from anywhere with an internet connection or cellular signal. Well you can. All you need is the IntelliMagic Vision Web Reporter. I personally like to use Safari from my iPad when I want to get away from my physical desk every now and then. Here’s an example of an IntelliMagic Vision Web Reporter screen shot of My Personal Dashboard from Safari. The IntelliMagic Vision Web Reporter provides a robust interface to the superior analysis that the Windows Reporter has long provided, but does not require each user to install and maintain additional software on their PC. All the user needs is a URL link and they can access IntelliMagic Vision with the browser of their choice. Going back in time again, we had to react to problems. When I was finally paged about something, impact was already happening. An effective mainframe performance management solution should provide you with early warnings before issues occur. IntelliMagic Vision provides that early warning system and has many reports that show if all is ok (green), if a metric has suddenly changed to cause an exception (red), or if there is a warning (yellow). These rated reports can be automatically generated if they go yellow or red, or you can easily spot them when looking at the Web Reporter. Interactive data navigation is an essential feature for every performance analyst when performing root cause analysis. Static reports that require manual coding or expert level understanding to know where to investigate further is no longer the only option for z/OS performance analysts, and it’s usually not the most effective either! With the ability to start at a high level overview covering your entire end-to-end z/OS infrastructure and drill down to the root cause within a few clicks, guided by the built-in ratings and recommendations, resolving service disruptions becomes much more streamlined. Drilling down to more granular analysis is very simple using the IntelliMagic Vision Web Reporter. I can even use my Smartphone to view interactive reports and drill down from high level charts to specific areas of concern. Read our blog, Root Cause Analysis for z Systems Performance, to see how easy it can be. I absolutely love the way you can customize reports within IntelliMagic Vision. Here is a screen shot of all the options in just one of the reports. I started here with the CPU per service class report. Really digest how many things you can customize using this screen. Once you get the report how you like it in the preview, you can save it to your collected pane, your favorites, or as a Dashboard frame. 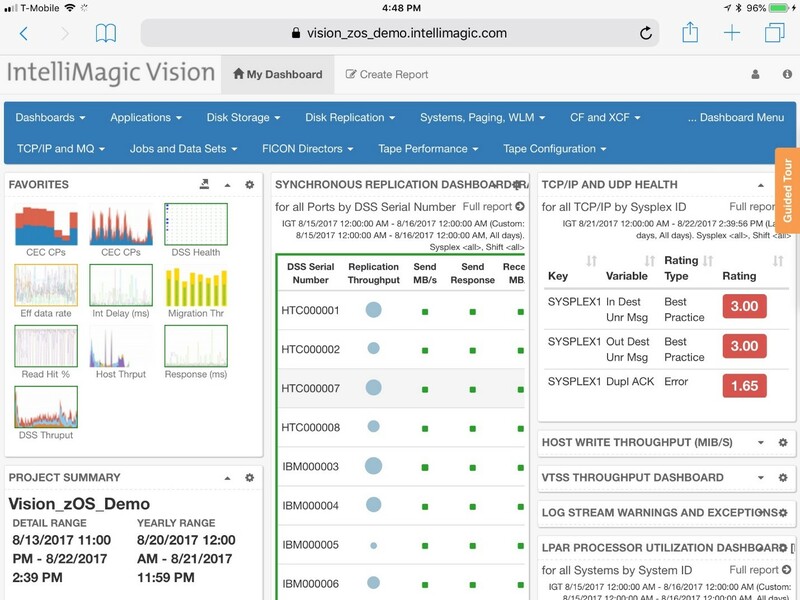 The IntelliMagic Vision Web Reporter allows you to set a filter that applies to every report. This feature is called the Global Filter. You can make the global filter as complicated or as easy as you would like. Typically, I use it to look at one particular LPAR. When you turn the global filter on, every report (even the thumbnail previews) is filtered by that System ID (when applicable) until you turn the global filter off. One of the most powerful tools in a performance analysts toolbox is the ability to interact with the current data and compare the history to understand the context of the issues. In most situations, just looking at a performance exception (even one that is rated), is not enough to determine what the problem is, or if it’s even a problem at all. That’s where trending and comparisons come in. By being able to interact with the current data and compare the metrics with the previous day, week, month, day of the week, or any other interval that is relevant to me, I can see if this performance exception is indeed a serious spike that needs my immediate attention, or if it’s just a normal trend that occurs every Tuesday at 6pm. And of course, finding recurring patterns in the data can be very useful. 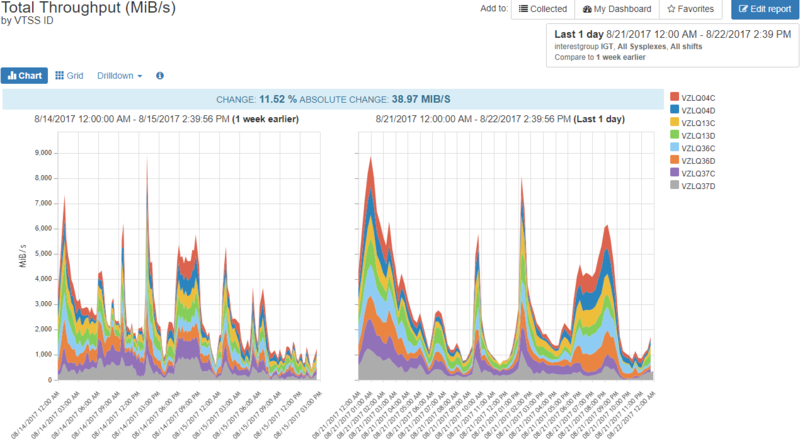 In this example, you can see that throughput has increased by simply comparing to the previous week. The comparison chart even quantifies both the absolute change in the value of the metric and the % change. Back in my MVS Operations days, when we were still tied to a PC at our office desk, it was not easy if I wanted to pull a report to analyze further, share with my colleagues, or discuss with my manager. Usually it meant a lot of manual data analysis, exporting the raw data into an Excel sheet, and numerous hours trying to add context and highlight the important issues I wanted to discuss. Thankfully, that’s no longer the case. With a solution like IntelliMagic Vision, I have numerous options to share my graphical reports with my colleagues or export them for additional analysis. I can send any report I’m looking at to anyone in my organization by copying the URL and sharing it. I can email the set of reports that I’ve collected or saved to my favorites. 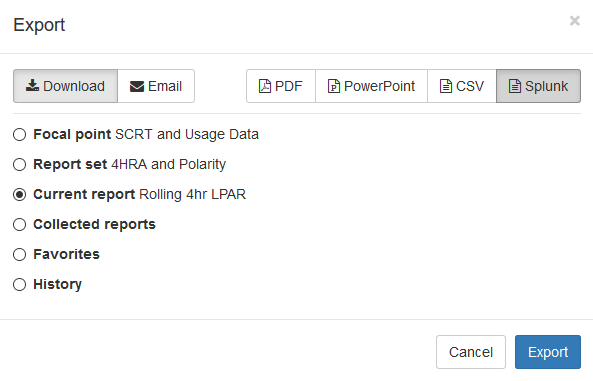 I can download my reports as a PDF, PowerPoint, CSV, or even Splunk format. Having this type of quick and painless report sharing would save hours for a z/OS performance analyst, not to mention the headache of trying to get all their reports organized and sent before a deadline. You are not limited to relying on your memory any longer. With IntelliMagic Vision, you can easily set up automation to alert you, your team, or anyone else about a variety of things. You can be alerted if a rating goes from good to bad. You can get regular reports sent to your email or an addressee list. Your imagination and innovation can utilize IntelliMagic Vision in many ways. Alerts from z/OS are common. Some come with software packages, some are part of the operating system, and some are written by Systems Programmers or your Developers. z/OS performance analysts are no stranger to a constant barrage of alerts, but what do those alerts really tell you? I wrote in a previous blog, Do Not Settle for Bad z/OS Alerts, that although alerts are intended to benefit your business, they almost always result in a lot more work just to understand if the alert is valid and important; not to mention that there is always much more analysis to perform to understand the root cause. For an alert to actually be meaningful and helpful, rather than just alerting you to a missed threshold (usually without any context), it should provide you with all the necessary information for you to be able to determine if this is a serious issue that requires your immediate attention, or if it’s simply something you should keep your eye on, but you can probably get to tomorrow morning. Below is an example of an Exception Table in IntelliMagic Vision. Looking from left to right, we can see which report the issue is coming from, the type of report it is, as well as the Key, Value, and Variable. The columns on the right, however, help us determine the severity of the problem and provide recommendations to solve the issue. We can see the numerical rating, as well as the Rating Type and Severity, and the Observations and Recommendations column provides us information on exactly what has happened to cause this alert, and actionable insights into how we can resolve the issue. So, imagine this scenario. You are watching your son’s soccer game. Your team is winning by many goals, and the sun is shining. But suddenly you get that call from work that you dread. The z/OS system at work is running poorly, and applications are suffering. Do you have to leave the game and head home to your laptop, or worse, to the office to troubleshoot? No, because you happen to have your iPhone with you, so you just punch up the IntelliMagic Vision Web Reporter. Since you are collecting and processing data every hour, you can easily see the problem that has been driving Operations crazy for the past few hours and determine the root cause. You work on the issue during halftime, send a quick email to operations with a fix, collect the orange peels, and cheer your son on to victory in the second half. No one knows that you were actually working in the stands, so the other parents won’t criticize you for pulling out your laptop at the game!